The Dainese D-Air airbag system is coming to the United States. For real. After first announcing the D-Air system in 2011, Dainese brought this technology to the European market three years ago in 2012. On this side of the Atlantic, we've been waiting. Regardless, the D-Air Racing system is coming and it's coming soon. Beginning this September, the D-Air system will be available in the top-tier Misano Race Suit ($2,499) and as an option in the Dainese Made To Measure Mugello Race Suit, giving hard-charging track-day riders and amateur racers access to the same kind of protection the pros have. 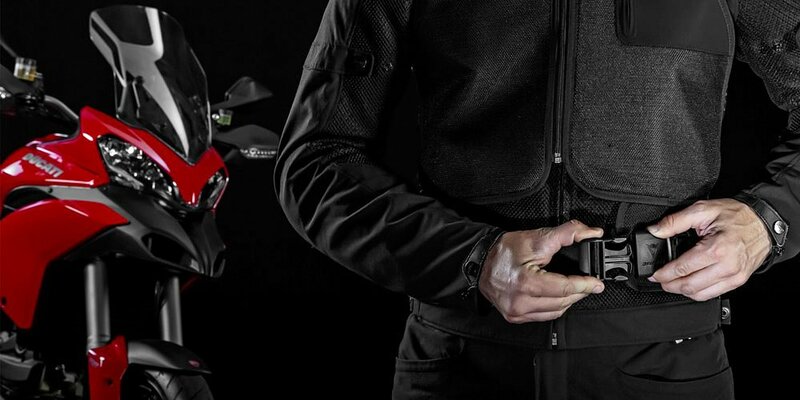 Meanwhile, Dainese also says that next year we'll get the D-Air Street system, which is a jacket with the airbag system that a rider can wear on any bike, so you can have the same level of protection, even when you're not racing. Nicky Hayden in his D-Air race suit. Dainese photo. The Dainese D-Air system is the first air-bag system to hit U.S. shores, with Alpinestars' Tech-Air system still only available to race teams and the European market — although I really can't blame them for taking their time to bring it over. Dainese Misano D-Air Race Suit. Dainese photo. Unsurprisingly, our sue-happy country gave the Italians reason for pause and their lawyers delayed the U.S. release until they had their bases covered (lots of pieces of riding gear are labeled for off-road use or as roost/rock guards so makers can't be sued based on safety claims by our world-leading number of lawyers per capita). Dainese also said that they wanted to launch the D-Air in Europe first as a trial run, and because the system takes a special tool and computer for servicing once it has been deployed, which is much easier to do closer to their Italian headquarters. The D-Air system has gone largely unchanged, but for those of you who need a refresher, it's an airbag system that uses telemetry data from a sensor in the hump to deploy a four-liter airbag when a crash is detected. The system deploys within 45 milliseconds once it detects a crash, but knows not to in case of a low-side or at sub-30 mph speeds. D-Air onboard electronics. Dainese photo. Servicing the airbag once deployed comes with a $200 charge, unless owners opt for the $299 extended service plan, which gives the user unlimited servicing for a two-year period. I'm glad riders over here will finally get the opportunity to consider this next level of safety gear. I just wonder if we'll have to sign a waiver upon purchase.